Get ready. The human race is about to go Interstellar! Again…. On the heels of Voyager 1's historic 2012 breakout from our solar system, its twin, Voyager 2, has begun to detect signs that it too may be on the verge of entering interstellar space and crossing over to the great galactic beyond. Voyager 2 has measured an uptick in detected cosmic rays similar to what Voyager 1 reported in the months before it crossed the border six years ago. Cosmic rays are extremely energetic particles — mostly high-speed protons and atomic nuclei — that originate from powerful events, like supernovas, across the Milky Way galaxy. Within the confines of our sun's extended magnetic field, cosmic rays are much less abundant than they are outside of its protection, and scientists reason that an increase in cosmic ray detections is an indicator that Voyager 2 may be approaching the border. The Voyagers' passage to interstellar space is more than merely a historic milestone in space exploration. It means that we have scientific instruments in situ to probe and analyze the environment beyond our sun's influence — not unlike how we place weather stations on buoys far out in the deep ocean to explore the conditions far from land. Exactly what marks the boundary line or "membrane" between our solar system and interstellar space hasn't always had a clear definition. And, just as with any truly vast and nebulous thing, pinning down an exact point in space where the divide lies isn't so clear-cut. Decades ago, scientists talked about interstellar space as anywhere beyond the Oort Cloud, the vast and tenuous region of ice, dust and comets believed to envelop the sun and planets. Though there is scant physical evidence for the Oort Cloud's existence, its outer boundary is believed to extend almost a light year into space. At its present speed, Voyager 2 would take over 15,000 years to reach that milestone. In more recent years, scientists have turned their attention to the "heliosphere" as a more suitable signpost for interstellar space — something whose boundary is more measurable than the uncertain and distant extents of the Oort Cloud. The heliosphere is a bubble-like region surrounding the sun where the environment is dominated by solar plasma particles and magnetic fields — the "solar wind" that blows outward in all directions. The intervening zone where the solar wind slams into the gases and magnetism spread between stars of our galaxy is called the heliopause. It is this heliopause that scientists have defined as the boundary to interstellar space. How Does a Space Traveler Know When They Have Crossed Into Interstellar Space? When a sailor voyages out across the ocean, they may first travel through wind and water currents shaped by the land they departed. At some point as the land recedes and its geographical and meteorological influences ebb, and the ocean floor drops away to greater depths, the sailing environment changes. Wind and water currents of the deep ocean take over and begin to dominate. That's when a sailor knows they have departed continental conditions and entered deep ocean. Now put the sun in the role of the sailor's home continent. The sun's influence on the space surrounding it includes its gravitational pull, the electromagnetic radiation it shines, and the rarefied "solar wind" that consists mostly of electrically charged hydrogen and helium nuclei. When Voyager 1, the more distant of the Voyager pair, began to pass through the heliopause, it was not immediately clear to scientists when the final and official arrival at interstellar space occurred. Just as the wind and water currents at the boundary of continental influence and deep ocean may have an interaction zone of "choppy" conditions, so does the heliosphere generate some "turbulence" when it slams into the interstellar gases. Voyager 1's passage through the choppy heliopause was marked by several buffets before scientists finally declared clear interstellar sailing. When Voyager 1 Passed Through the Heliopause, Was There a Popping Noise? We can imagine that Voyager 1 was tossed and slammed by blasts of turbulence as it crashed dramatically through the heliopause, or that some kind of solar "membrane" was penetrated, possibly to pop! But nothing so dramatic took place. In fact, had there been a human astronaut on board looking out the window, they would never have noticed the passage. 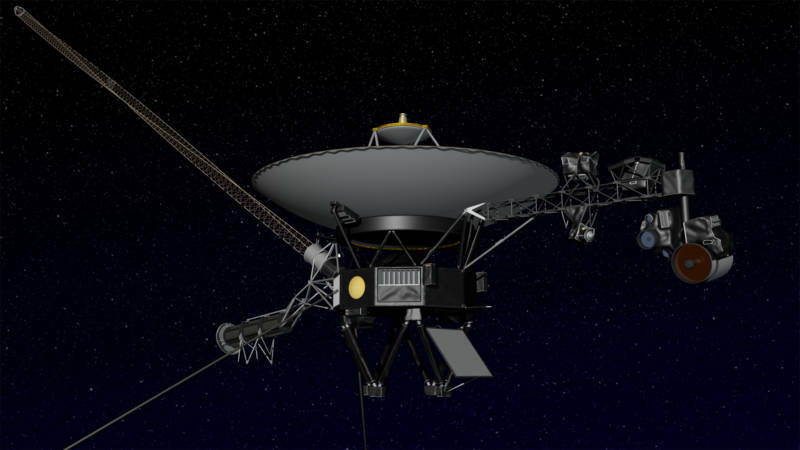 To detect the crossing, scientists had to look to the data collected by Voyager 1's instruments. The most straightforward telltale of departure might have come from measurements of the temperature and density of plasma particles, registering a decrease in the hot but sparse ions of the solar wind and an increase of the cold but more abundant particles of interstellar space. Unfortunately, Voyager 1's particle-detector instrument stopped working in the 1980s, shortly after its last planetary encounter, Saturn. 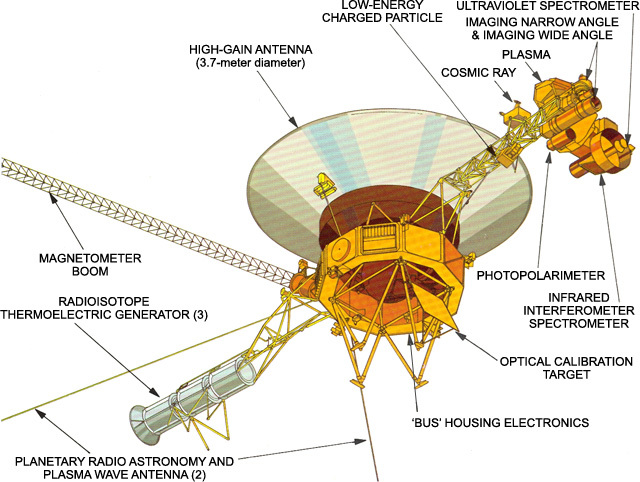 Instead, scientists relied on measurements from Voyager's plasma wave instrument, a pair of radio antennas that listen for oscillations in the surrounding plasma. The frequency of oscillations can be used to calculate the plasma's density. There was initially some back-and-forth fluctuation in the plasma wave readings as Voyager 1 passed through the choppy fringes of the heliopause, but ultimately the spacecraft emerged into an environment where surrounding plasma was 40 times denser than inside the heliosphere — very close to what models of the interstellar environment predicted. It wasn't until late autumn in 2012 that Voyager scientists, looking back across several months of collected data, felt confident in pinpointing the moment that the human race went interstellar, and though there was some debate over it, scientists eventually agreed the event occurred in August 2012. 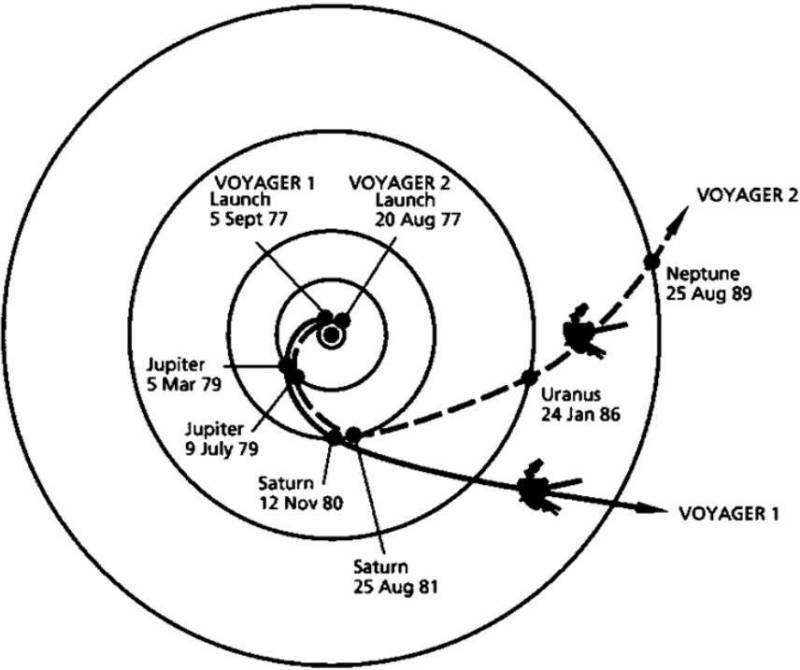 As for Voyager 2, NASA has been clear in stating that it's not there yet. But the rise in cosmic ray detections by Voyager 2 may be the harbinger of its impending graduation to interstellar voyager. Voyagers 1 and 2 launched in 1977 on an unparalleled mission to explore the gas giant planets of the outer solar system. Voyager 1 flew by Jupiter in 1979 and later Saturn in 1980 before cruising on toward its eventual and inevitable encounter with interstellar space in 2012. Voyager 2 spent a bit more time exploring planets before hurtling onward. It trailed its twin by a few months with flybys of Jupiter and Saturn, and then pressed on to swing by Uranus (1986) and Neptune (1989), and is still the only spacecraft to have visited these twin "ice giant" worlds. 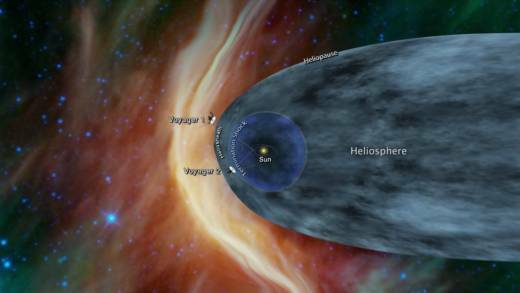 As of this month, Voyager 2 is over 11 billion miles from Earth, and traveling away at about 35,000 miles per hour. Voyager 1 is a recording-breaking 13.4 billion miles away, over three times the distance to Pluto — a distance that takes light and radio waves almost 20 hours to traverse. But diminishing power supplies on both spacecraft will force NASA to begin shutting them down in the near future. Wanting to collect as much scientific data as possible on the conditions of interstellar space, instruments will be shut down incrementally to conserve power for those that remain on duty. For Voyager 1 this will begin in 2020, with the final off-switch being flipped in 2025. Then, each spacecraft will coast onward through interstellar space, orbiting the Milky Way galaxy indefinitely.